does just roasted coffee need a period of rest time before being ground & brewed? 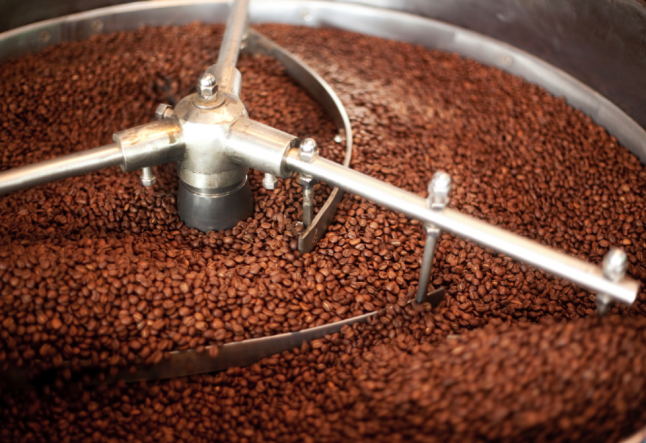 There is a widely believed myth in the professional coffee community that “just roasted” coffee requires a period of time to “rest” or “degas” before it is ready to be ground and brewed (I am replacing the term “fresh roasted” coffee with this new term, “just roasted”, since interpretations of what is “fresh” vary widely. My definition of “just roasted” coffee is coffee that has been roasted and cooled to room temperature). This myth enables coffee roasters and producers to package just roasted coffee into vacuum sealed bags that give the coffee a mis-conceived appearance of being “fresh” thus elongating shelf life. These vacuum sealed packages are equipped with one-way valves that allow the gases to escape into the atmosphere. This “degassing” process takes about 7 days with almost 1/2 of these gasses leaving the porous coffee bean after just 24 hours. But letʼs back up a bit to understand this entire process and think it through in a logical, systematic manner. During the coffee roasting process, there are over 1,000 chemical substances and compounds that are created and many of these are in the form of gases. The green coffee seed is transformed during this process. It loses 25% of its weight yet increases in size by about 40%. By waiting and allowing these chemical substances to escape from the porous coffee bean is, in this authorʼs opinion, allowing the decomposition and de-struction of the best part of the entire process. These chemical substances have powerful life giving properties that affect the brain and body in miraculous and potent ways. Parts of the brain are activated that have to do with creativity, positivity, imagination and inspiration, to name a few. Enhanced is the brainʼs ability to focus energy and attention which is the way, as humans, we create. Increased energy in the human body, enhanced coordination, balance, flexibility, are all benefits that can be maximized when consuming just roasted coffee. One of the reasons given for the need to “rest” / “de-gas” just roasted coffee is to allow the CO2 gas (that is created through the roasting process) to escape so that the coffee bean has “stabilized”. Why? Is CO2 harmful? Does it affect taste? Not at all, in fact, we add CO2 to beverages in order to create carbonation. Is it necessary for us to “rest” / “de-gas” a carbonated beverage before consuming it? No. MOST people roasted their own coffee at home and enjoyed the chemical benefits). Now with more recent technology it is becoming easy and economical to roast green coffee at home and consume it right away. Solution: Small in-home coffee roasters that are inexpensive to buy and operate are becoming available for purchase to coffee consumers. Sourcing and buying green coffee is becoming increasingly popular and a new market is being created to satisfy this need. Coffee drinkers are once again able to enjoy just roasted coffee in their home giving them the benefits of consuming these beneficial chemical compounds...AND...saving money at the same time! A Re- Evolution is occurring among coffee lovers and enthusiasts that is slowly spreading and gaining momentum. Conclusion: Coffee is the worldʼs most widely used drug yet the vast majority of what is available is of inferior quality. By changing the way we make and consume our coffee we can greatly affect our mood and enhance our life experience.